The legendary Guns N’ Roses singer, and recent touring as the frontman for AC/DC, has already revealed his love of HYT, regularly sporting the Skull. 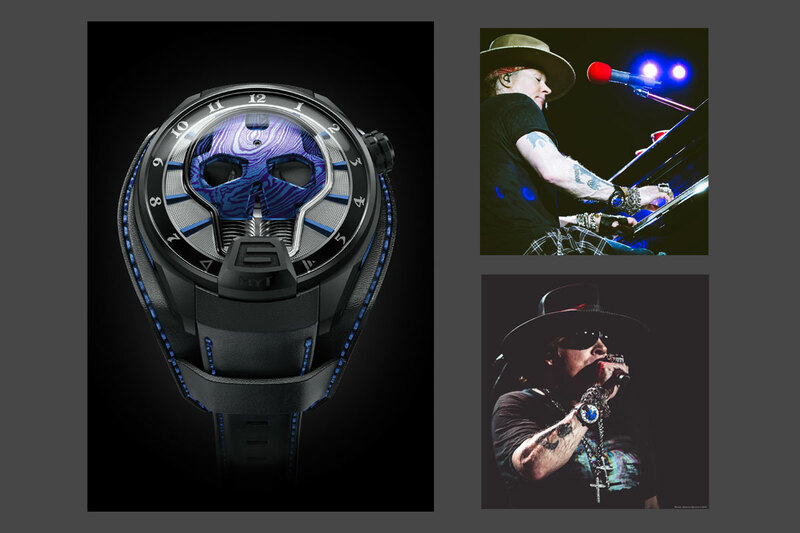 Now, Axl and HYT have launched a limited edition exclusively designed by the artist. Axl Rose, a founding member of Guns N’ Roses and probably one of the most uncompromising and respected rock artists of the last 30 years, really has nothing left to prove. The much-loved singer has made his mark in rock history thanks to his unmistakeable voice. Non-conformist and provocative, Axl Rose has chosen a HYT to adorn his wrist. For several months, Axl has been seen wearing the Skull model, most notably during the recent explosive AC/DC shows and the blockbuster Guns N’ Roses Not in this Lifetime world tour. The Skull Maori was his preferred version. But was he really going to stop there…? The Skull Axl Rose is a custom model created by Axl Rose. The artist chose a Skull base which, under his direction, was given a Damascus steel style treatment. In addition, he requested that this was given a blue treatment. For a complementary touch, Axl opted same colour for all the indexes applied around the Skull. Finally, he chose to affix two side plates to the piece (at 9 o’clock and 3 o’clock), decorated with the Clous de Paris pattern and also finished in blue PVD. The piece has a resolutely rock’n’roll feel, with a bold strap featuring blue topstitching. 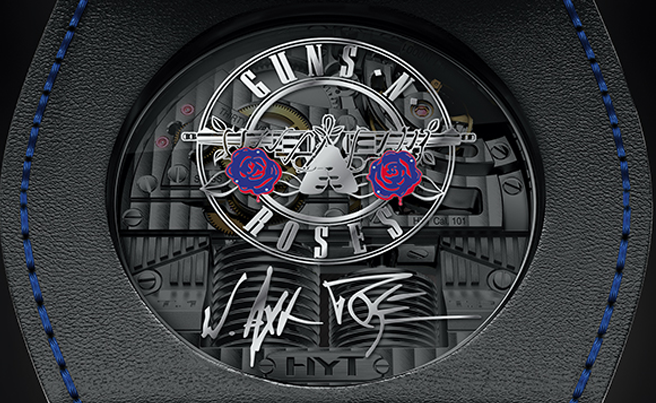 On the back, HYT pays tribute to the rock icon in the form of the legendary Guns N’ Roses logo. Underneath this sits the singer’s signature on the metallised sapphire case-back. The piece, which features a 51 mm DLC titanium case with microblasted finishes, will be available in December 2016 in an extremely limited edition of just 25 pieces. · water resistant to 50 metres.